Xola is the tiny new 15-seater taqueria from chef/owner Mali Fernandez (formerly of Embrujo Flamenco) that opened this summer on Queen East in the Beaches. Inside, the modest sized dining room is cozy and smartly sparse. 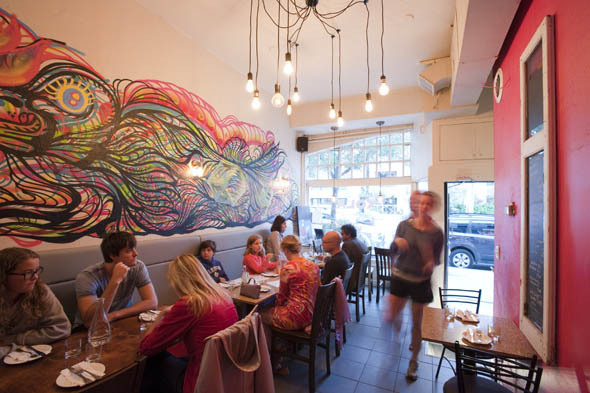 The decor features hanging filament lights and colourful graffiti from Mexican mural artist, Andre Castro. On a recent weeknight when I stopped in, the windows were steaming up and the place was packed to the brim as locals streamed in for take-out at a regular pace. Fernandez originally hails from the Xalapa region of Veracruz on the Gulf coast and opened this restaurant to showcase the flavours of the Mexican madre tierra (motherland). The menu features an array of snacks, ceviches and taquitos. 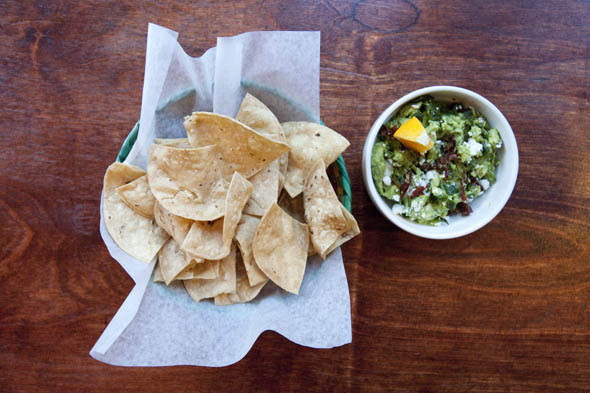 There's traditional guacamole ($8) but also four innovative variations like say, a goat cheese, sundried tomato and poblano pepper studded version. Taquitos estilo Baja ($15) come three toasty tortillas per order topped with golden fried pieces of fish. 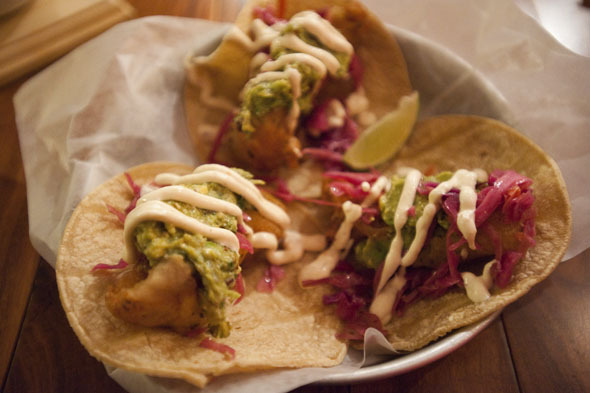 They're garnished with slaw, avocado, jalape単o salsa and habanero mayo for perfect balance of hot and cold; creamy and crunchy. 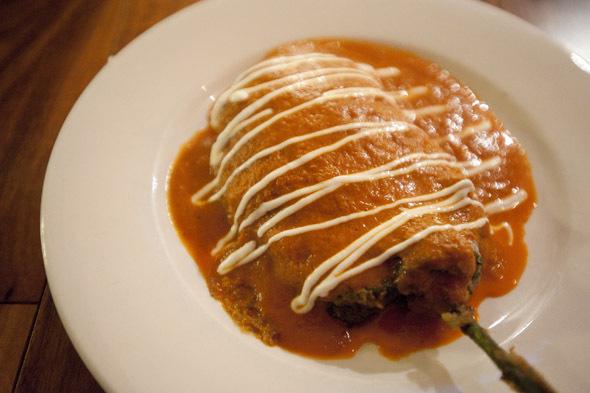 Chile Poblanos ($10) are a hearty vegetarian dish that sees black bean and queso fresco-stuffed peppers bathed in a saucy roasted tomato caldillo. Today, the off-menu specials include steaming bowls of Pozole, a rich stew that could be a hearty meal on its own. It comes topped with lettuce that wilts into the broth and is served with cold garnishes like crunchy radish slices, chopped onion, house made salsa and lime wedges. 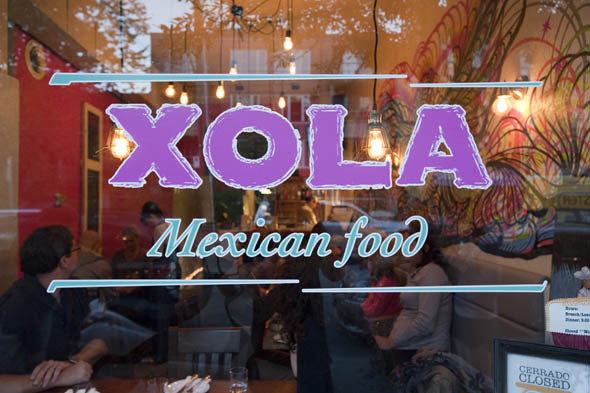 At brunch and lunch (from 11am to 2pm), Xola offers Mexican standards like chilaquilles ($9), tamale trios ($9) and variety of burritos ($7.50). Coffee is supplied by neighbouring roaster, Higher Grounds, and horchata ($4) is available along with Mexican sodas. Xola is open Wednesday through Sunday for dinner starting at 5pm. Take-out orders are encouraged since seating is so limited.